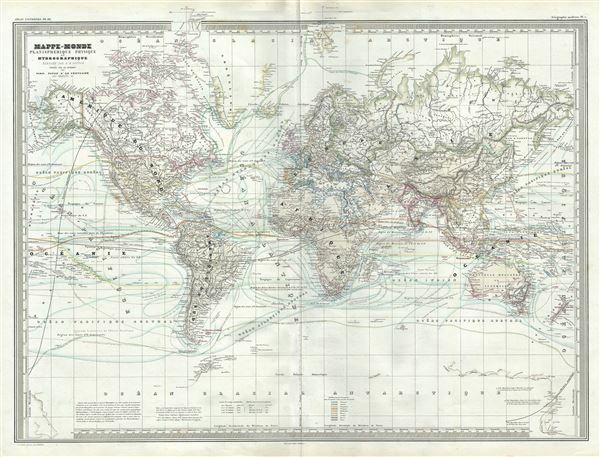 Mappe-Monde Planispherique Physique et Hydrographique. This is an unusual 1860 elephant folio map of the world exhibiting its planispheric, physical and hydrographic features. The map shows extraordinary detail throughout noting European possessions around the world, cities, islands, rivers, lakes, mountains, deserts, oceans and ocean currents, magnetic curves, isothermal lines, sea routes of explorers and a host of other geographical, topographical and physical features. Several notes are included along the bottom border of the map. It offers fairly accurate shorelines throughout, while much of the interior in Africa and Australia remains unmapped and vague.